I remember my first, probably illegal, foray into liqueur production. Like many great discoveries, it happened by chance. A bottle of orange squash, barley water or something similar had slipped down behind the desk in my room at school and had lodged behind the radiator. When I came across it many weeks later, it smelt distinctly alcoholic, looked radioactive, and was probably poisonous, but it tasted pretty good, along the lines of Grand Marnier (OK, that’s being somewhat generous, and as a 17-year-old schoolboy I wasn’t exactly Robert Parker, but it was at least drinkable). However, despite this initial success, I abandoned what could have been a promising career in soft drink transformation, and many years would pass before my next experiments in the field, this time on purpose. One of the signs that Italy is a civilized country is that you can walk into a supermarket and buy a bottle of alcohol. It is assumed that you’ll be using it to make liqueurs with, rather than to kill yourself or manufacture Molotov cocktails to throw at shop windows (apart from anything else, there are much cheaper ways of doing either, since pure alcohol is no bargain, coming in at about 20 euros a bottle). 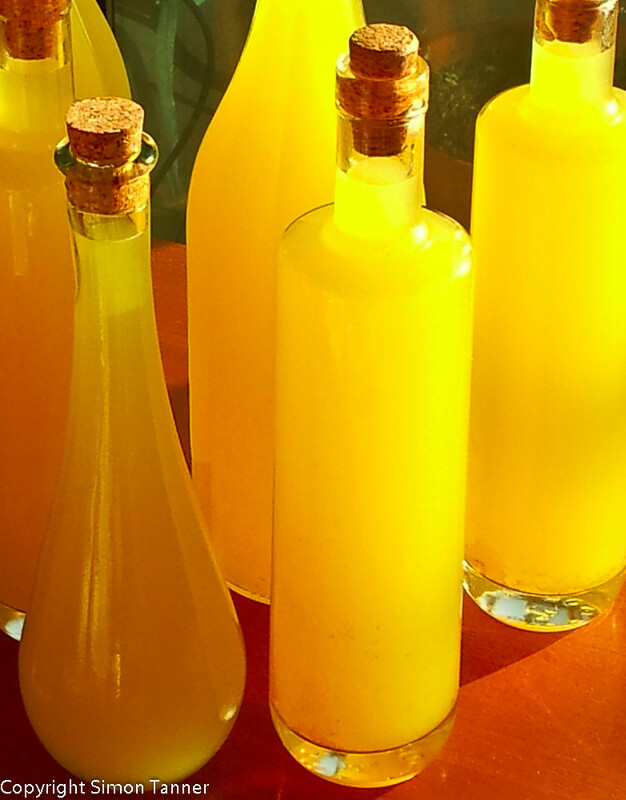 I’m not sure in how many other countries this is possible, or even if you’re allowed to buy it here and then take it back home in your luggage as you would with wines or spirits, but I’m hoping so, because homemade limoncello is a joy, sunshine in a bottle. I have, over the years, tried many versions, both industrial (nearly always over-diluted and over-sweet) and homemade (more akin to paint-stripper than something I would actually get pleasure from drinking), and have asked various housewives and restaurateurs what the ideal proportions of alcohol, water, sugar and lemons are. You see, this is a very simple recipe, with only four ingredients, but the variations are of course infinite, both in terms of quantities and infusion time. What you see below is the result of strenuous, self-sacrificing research in harsh experimental conditions. My version comes in at about 30% ABV, and is not too sweet, allowing the aroma of the lemons to come through (which is of course the whole point). It’s best served cool from the fridge, and is the perfect for cleansing your palate after fish, for example, or for sipping on summer evenings after dinner. And although this is something I associate with warmer weather, now is the time to make it, since lemons are at their best this time of year, and in any case you’ll want to leave your limoncello for a month or two before cracking it open; it mellows nicely with age. Zest of 14 lemons (really, just the zest – cut away any white pith). 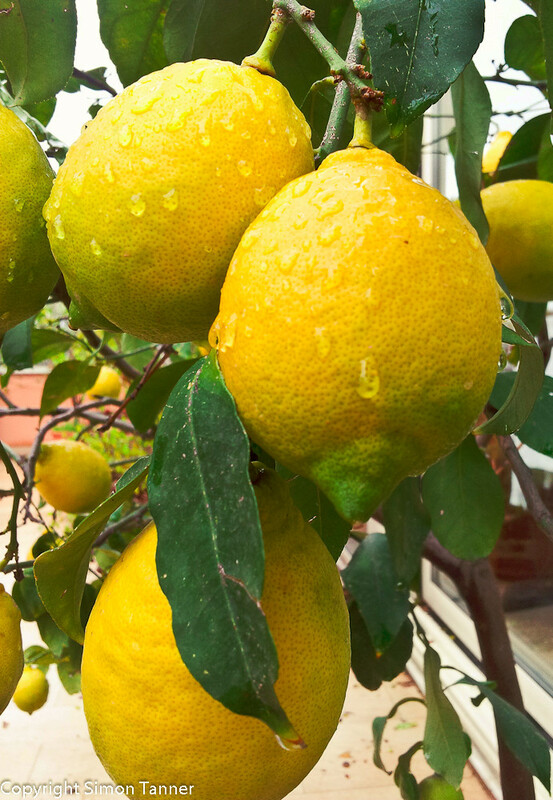 The lemons need to be unwaxed, organic, picked by yourself… Whatever it takes – get the best you can. Mine come from the lemon tree on my terrace (move to Sicily, that’s my advice). Put your zest in clean jars with the alcohol and leave in a dark place (I just put mine in the crockery cupboard) for four weeks. By this time the zest will have turned white and brittle, and the alcohol will have a beautiful deep sunny hue. It will look psychedelic, yet disturbingly like something from a school biology lab. Filter to remove the zest. Make a simple sugar syrup by heating the water with the sugar until the sugar has completely dissolved. Allow to cool and mix well with the filtered alcohol. Using a funnel, pour into clean bottles and seal with corks or other stoppers. Leave to rest in a cool dark place for a month before opening. Keep in the fridge. This entry was posted in Uncategorized and tagged lemons, limoncello, liqueur by hungryenglishman. Bookmark the permalink. The limoncello from Amalfi is famous (they have a particular variety of lemons which give it a special flavour), and delicious! Yes, you can definitely keep it in the freezer if it’s over 30%. Happy Christmas to you too! Just as well I didn’t know about the alcoholic experiments at school! This does sound good though. Impressed you now have enough lemons on your tree. Why dilute pure alcohol with lemons? Vitamin C……Yuck!